Helloooo, pina colada! Well, strawberry pina colada. One of my favourite cocktails, made even more fruity and summery – and even more beautiful, too. Would anything be more impressive for a summer party than appearing with a big jug of strawberry pina colada?! The one and only time I’ve been on an all-inclusive holiday was when we went to Mexico on our honeymoon two years ago, and we drank so many amazing cocktails. They were free – it would have been rude not to. Especially since we could get them right from the swim-up bar and sip them in the pool in the glorious sunshine (can you tell I thought this was the coolest thing ever?!). The cocktail menu at our hotel was pretty long so we tried lots of different cocktails, but a pina colada definitely stood out as one of my favourites. It’s not a drink I’d had very often before (if I’m honest, I usually just buy cheap wine… don’t judge me), but it became a new favourite. Coconut and pineapple – perfect tropical flavours. A pina colada always makes me feel like I’m in the Caribbean (and considering gloomy Hertfordshire is about as far from Barbados as you can get, in all senses of the word, that’s really saying something). You can find the classic pina colada recipe on thebar.com – my go-to place for drinks inspiration. Cheap wine may be cheap, but come June, I usually fancy something a bit more summery and exciting, and fruity cocktails are perfect (or alcohol-free mocktails, if you want to take it easy!). I decided to put my own spin on the recipe, and added fresh strawberries for colour and sweetness. The resulting strawberry pina colada was a huge success! I actually think you could add all sorts of fruits to the classic pina colada recipe – maybe kiwi fruit or mango instead? I definitely feel I need to research this further. For science. If you’re throwing any parties or BBQs this summer (or, you know, Tuesday evenings), check out the huge selection of cocktail recipes over on thebar.com and let me know what you concoct! 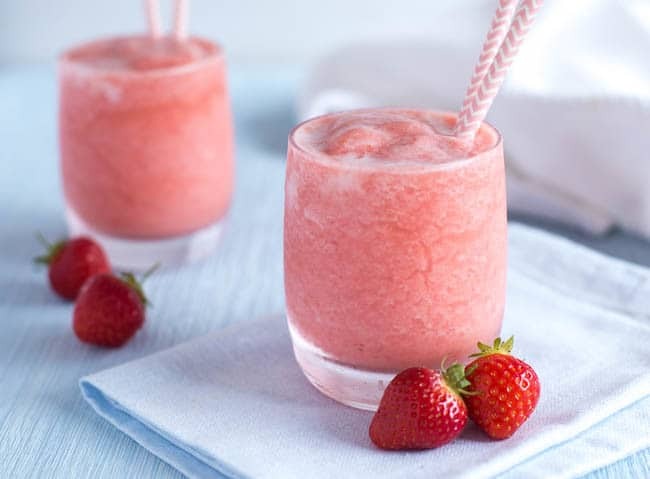 Add the pineapple, strawberries, coconut milk and rum to a high-powered blender, and blend until smooth. Add the ice, and blend again until no large lumps of ice remain. Serve immediately. Alternatively, if you don't have a high-powered blender that can cope with blending ice, just blend the first four ingredients together, and serve over ice. Pimm’s is another must-have cocktail for your summer party! I would love to be drinking this in Mexico at a swim up bar! Though not on your honeymoon, because that would be weird. My blender needs to let it’s hair down in the evenings and move from green smoothies to cocktails! This one sounds sooooo good. This is a great recipe! I want to arrange a girls night in and make lots of different cocktails. This one will be on the hit list! There are so many great cocktail recipes on the bar.com. Great for some summer inspiration. Yummy, these look delish! I’d love to try one! They remind me of Mexico too – those swim up cocktail bars! Ahh heaven! Yum these look great – I could just drink one now! I absolutely adore all the fresh fruit in this cocktail. I have to make it for my next Ladies Night. 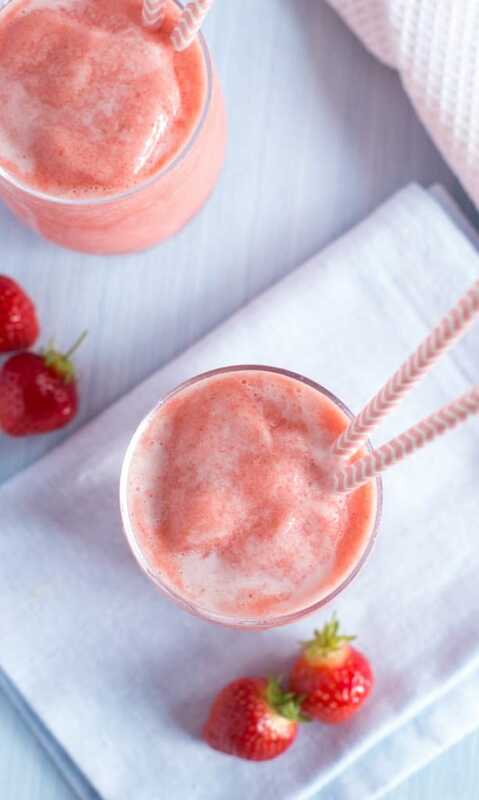 I feel like I need to have a summer party just so that I can make this srawberry pinac colada. Another great recipe from the bar. It feels like such a luxury doesn’t it! :) And thanks! They’re from a company called My Little Day, they have so much amazing stuff! and get a box of the colada mix. Pour 6 ozs of rum and 4 pkgs of the mix into the blender, add 1/2 small can of crushed pineapple along with 1/2 thejuice plus 6 ozs of milk. Top with ice and blend. keep adding ice cubes until they no longer sink. Pour into a glass and top with 1 tsp of Myer’s dark rum. Interesting! I’ve never seen a pina colada mix before. I usually just use rum, coconut milk and pineapple! This sounds great! Im working on a virgin version atm! This looks like the perfect drink for all those summer parties, when the rain eventually stops! 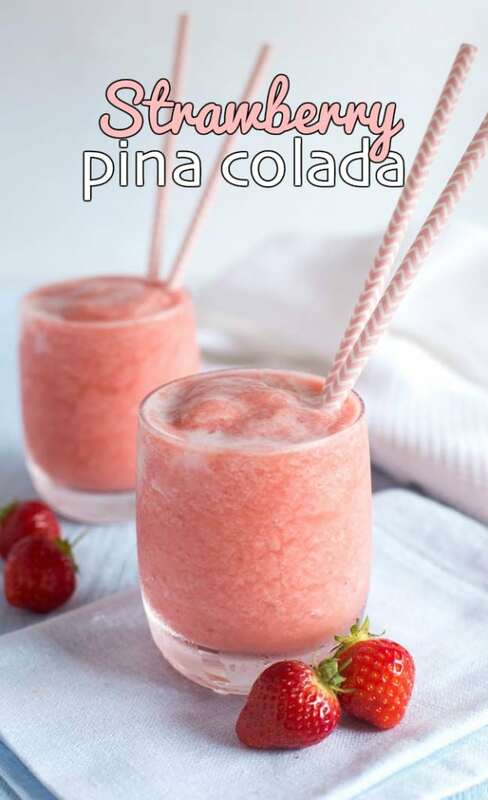 I love the sound of strawberry pina colada it’s that bit different and I bet it tastes great. Oh what I would give to enjoy one of these on a hot sunny evening. Rum and coconut milk just go SO well together. It reminds me of my honeymoon. To be honest this would be just as delicious without the rum, if you fancy one before the baby comes!! I definitely want to give this a try, thanks for posting! Pina coladas instantly remind me of summer holidays. Love the strawberry twist that you’ve given it. Perfect combo! 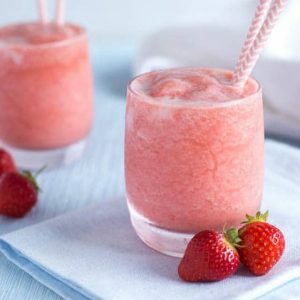 I love pina coladas and I love strawberry cocktails too so combining both together sounds like a win win to me! You could totally just skip the coconut milk in these! 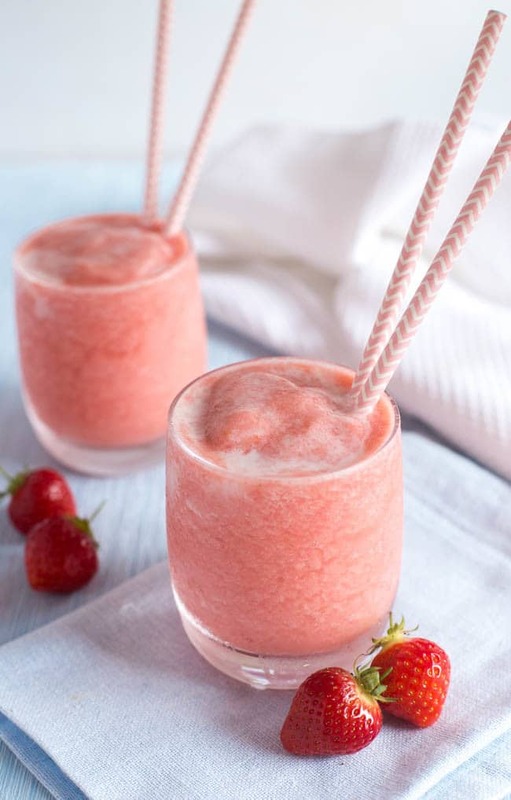 Oooo a strawberry Pina Colada sounds delicious! Pina Coladas are one of my favourite cocktails so I love the sound of this twist! This sounds delicious and so refreshing :) It would be a hit with my friends! Just the sort of thing to make a big batch of for a picnic or BBQ! Oh my god these sound like exactly what I need right now, so refreshing! Such beautiful photos by the way! Aw thank you so much Samantha! This sounds perfect. Am gonna try these with my leftover strawberries. The PERFECT summer drinks- yes please! Fresh, local strawberries are the best! Mmm, this sounds so delicious and perfect for summer! I rarely drink alcohol but when I do I tend to go for a drink with rum. This would definitely make a great party drink. This looks gorgeous and must taste so delicious – what a lovely combination of flavours. 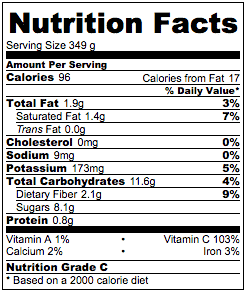 Mmm… I love the strawberry and pineapple combination. Must give this a try.